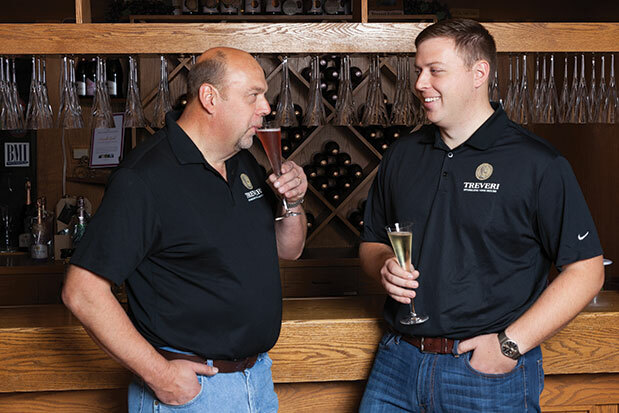 Treveri Cellars, based in Wapato (just outside of Yakima, and one of the first wineries you reach after descending off Snoqualmie Pass), has only been around since 2010, and yet it feels like a Washington institution. The winemaking team consists of father and son Juergen and Christian Grieb, and they only produce sparkling wine. In addition to traditional sparkling varieties such as Chardonnay and Pinot Noir, Treveri also makes sparkling Riesling, Gewürztraminer and Müller-Thurgau (inspired by Juergen Grieb’s training in Germany, these all have a kiss of residual sugar that makes them lovely pairings with salty cheeses), not to mention a sparkling Syrah for adventurous types (serve this one chilled with a charcuterie plate, and watch the wine and the food disappear). Steven Thompson began Analemma in 2010, when he was given the opportunity to farm Atavus Vineyard in the Columbia Gorge, one of the oldest active sites in the Pacific Northwest (planted in 1968, it is nearing the half-century mark). The original intention was to produce still Pinot Noir, but Thompson quickly realized that the climate at Atavus was “radically cooler than we had anticipated.” This realization “created a considerable diversion in our business plan,” a diversion that became his thrilling 2010 Blanc de Noir, a sparkling wine that spent a full 42 months aging on its lees (dead yeast cells that impart alluring bready notes on the best sparkling wines) and upon its release in 2014, raised an immediate question: Was this the finest sparkling wine ever produced in Washington? This is Treveri’s flagship wine as far as I’m concerned. It’s 100 percent Chardonnay, and it presents ripe fruit (stone fruits such as peaches and nectarines, tropical fruit such as mangos), a rich palate and a lovely mousse. What could be better than delightful, well-priced local bubbly? Made with 100 percent Pinot Noir from vines that were more than 40 years old at harvest. Expect a wonderfully complex sparkling wine, with loads of lees-y croissant notes, lemon and cherry fruit, and savory/salty chicken stock. This bubbly will be bone dry and super intense, with a lingering, mouthwatering finish. PAIRS WITH: Winemaker Steven Thompson favors delicate pairings, especially from the Pacific’s ice-cold bounty: Raw oysters and salmon sashimi fit the bill. One hundred percent Chardonnay from Premier Cru vineyards in the Côte des Blancs, which is the beating heart of Chardonnay in Champagne, this is a blend of 2005 and 2006 vintage juice, aged in bottle for a remarkable seven years and just recently disgorged. A fine example of the exceptional quality Bryan Maletis is importing for Fat Cork, it offers knockout aromas and flavors—apple and chalky mineral, hazelnut and brioche—on a finely moussed texture full of energy and verve. PAIRS WITH: “Champagne is king when it comes to food-pairing versatility,” notes Maletis. “It goes well with almost everything.” For an aged Blanc de Blancs like this one, Maletis recommends a rich pasta dish or a creamy, oozy cheese.